Electron beams travelling through the solar corona excite Langmuir waves near the local electron plasma frequency. When these Langmuir waves are converted into electromagnetic waves, the radiation can be detected by radio telescopes as bursts with very specific spectral signatures that depend on the magnetic structure which guides the beams. E.g., an electron beam that propagates upward along open magnetic fields produces a short pulse of emission at systematically decreasing frequency while the beam proceeds into more and more tenuous plasma. Such emission is frequently observed from decimetric to kilometric wavelengths, and is called a type III burst. When the guiding magnetic field is a closed loop instead of an open structure, the beams will first travel to lower densities, creating a type III burst-like feature, but then they will again travel to higher densities beyond the loop summit, and create a burst with the opposite drift. The overall spectral signature will resemble the letter U, and the burst is therefore called a type U burst. Illustrations of such bursts are given in the dynamic spectrum in the left-hand panel of Figure 1, where bright emission is shown by dark shading. The short-lasting emission at the beginning of the event, extending from about 300 MHz to the low-frequency border of the plot at 100 MHz, is a type III burst. At frequencies higher than 200 MHz (λ<1.5 m) it is followed by a type U burst that is reversed because in the representation used here the frequencies are decreasing from bottom to top, and by a fainter burst (indicated by the red arrow) which again drifts from high to low frequencies. Caroubalos et al. 1987 ( ApJ 319, 503), were the first to identify such bursts in metre wave spectra, and called them type N bursts because of their shape in dynamic spectrograms. They attributed the burst to an electron beam that propagates in a coronal loop and is magnetically reflected in the leg opposite to the one where it was accelerated. The spatial and spectral type N burst observations in Figure 1 are consistent with the interpretation of Caroubalos et al. because the sources of the first rising and the descending branch are on either site of a loop summit, and the source of the third branch of the type N burst is at the same place as the previous descending branch. Figure 1: Spectrum of a metre wave type III burst followed by a type N burst, Potsdam Astrophysical Institute spectrum on the left, in reverse grey-scale representation; horizontal lines are due to terrestrial emitters. The red arrow points to the second rising branch of the type N burst at frequency 237 MHz (λ=1.27 m). The type N sources at this frequency observed with the Nançay Radioheliograph have their centroids at the places labelled with light blue points on top of the Yohkoh/SXT image on the right: the first rising branch of the type N burst is at the position labelled 1, the descending branch and the second rising branch at position 2. They overly a system of X-ray loops. The white line is a dipolar field line drawn through the radio sources (after Aurass et al. 1994, Solar Phys. 155, 203). The number of type U bursts decreases with deceasing frequency, and this is readily understood by the fact that closed magnetic structures become rarer at increasing altitude. Leblanc et al. 1983 ( A&A 123, 307) argue that type U bursts at metric and longer wavelengths are only observed in transient magnetic loops associated with coronal mass ejections (CMEs). E.g., only one type U burst observation (Leblanc et al. 1999, GRL 26, 1089) and no type N burst was ever reported in the spectral range of the WAVES spectrograph aboard the Wind spacecraft (Bougeret et al. 1995, Space Sci. Rev. 71, 231), which has continuously monitored solar radio waves below 14 MHz for more than 10 years. On 2004 January 20, the ground-based Culgoora spectrograph and WAVES observed the bursts shown in Figure 2. At metre wavelengths (Culgoora) a group of type III bursts (07:34 – 07:39 UT) were seen, followed by lanes of a type II burst (07:39 – 07:58 UT) associated with a coronal shock wave. The decametric-to-kilometric spectrum at WAVES (14 MHz-20 kHz) shows an initial emission which pursues the type III burst to lower frequencies. It is followed, in the 10-1 MHz range, by a different feature: while the type III burst proceeds to lower frequencies, part of the emission turns to a drift towards higher frequencies (near 2 MHz; point labelled 2 in the figure), showing a clear type U burst. After point 3 (about 10 MHz), there is again a drift towards lower frequencies. At frequencies below 2 MHz the previous type III burst and the subsequent emission merge into an apparently smooth feature, but the high-frequency limit drifts again towards lower frequencies. The radio spectrum is reminiscent of a type N burst at metre wavelengths, and we refer to this feature as a decametric type N burst in the following. Figure 2: Dynamic spectra of metric type III and type II bursts (Culgoora Radio Observatory, 570-18 MHz, on the left) and of a decametric-to kilometric burst (Wind/WAVES spectrograph, on the right) consisting of an initial type III burst and subsequent type U/type N emission. Horizontal lines in the spectra are interference from artificial emitters. 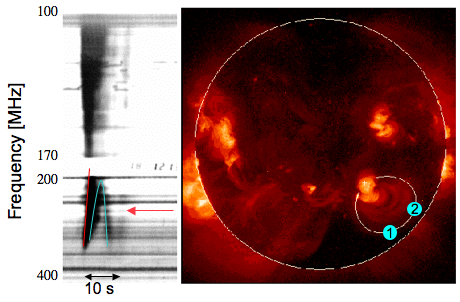 Decametric type N emission: a signature of mirroring in large-scale coronal loops? If the mirroring were due to the convergence of magnetic field lines in the opposite leg, it would be hard to understand why an electron beam starting near 180 MHz (assuming the type N burst emitting beams come from the same source as the type III burst emitting beams) is mirrored at much greater height in the opposite leg, corresponding to plasma emission near 10 MHz. This would require a very asymmetric loop, i.e. strong magnetic fields at much greater coronal heights in the opposite leg than in the leg where the electron beams are accelerated. Such an imbalance of magnetic fields is not plausible in the corona. As an alternative to mirroring by the quasi-static magnetic field configuration one can envisage reflection at the shock associated with the metric type II burst which occurs at the time of the decametric type N, assuming that the shock intersects the remote leg of the presumed large-scale loop at the time when the type U electron beam travels downward. But in this case one would expect that the type N’s turnover point 3 be in the vicinity of the type II lanes, whereas it occurs at much lower frequencies. Both interpretations conflict of course with the usual argument that static loops with height of several solar radii are unlikely to exist in the corona. The observation of several CMEs during the day of the type N burst suggests an alternative interpretation: the type N burst occurred in association with a CME that itself lifted off a few hours after a previous CME, shown in Figure 3 (see LASCO images at 00:30 and 00:54 UT). A noteworthy feature is the bright dipped structure at the interface with a pre-existing streamer (see the middle panel in Figure 3). The extension of the streamer shrunk as the CME expanded and pushed against it, demonstrating a real interacting between the two structures. We ascribe the dipped structure to a freshly reconnected flux tube between the expanding CME and the streamer, as suggested by the red field lines in the cartoon scenario of Figure 4. LASCO difference images (right panel of Figure 3) indicate that closed loop-like structures are continually formed during several hours following the onset of the CME. The large closed structure in the difference image at the time of the type N burst has its apex near 6 solar radii at 07:54 UT. Figure 3: SoHO/LASCO observations of a CME launched about 8 hours before the radio event and its evolution until the time of the radio event including the decametric type N burst. Note the continued evolution of large-scale loop-like structures in the difference image on the right, taken near the time of the radio event. If electron beams propagated along such a dipped magnetic field line, they would be expected to create a type N burst, with the first ascending branch travelling over a long distance up to the summit of the dipped field line, producing type III-like emission. After the summit the electron beams travel to lower heights, and into a denser plasma, and emit the descending branch of the type U until they reach the dip of the transient field line. Thereafter they propagate outward again, i.e. to lower densities, and emit at successively lower frequencies. A cartoon scenario for the sequence of CMEs under discussion is shown in Figure 4. 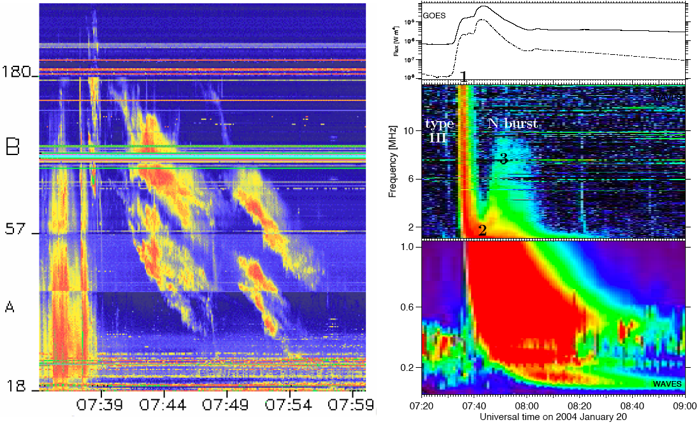 The top panel shows the CME launched near midnight, and the bottom panel the CME launched with the radio event under discussion, as it interacts with the magnetic configuration created by the midnight CME. 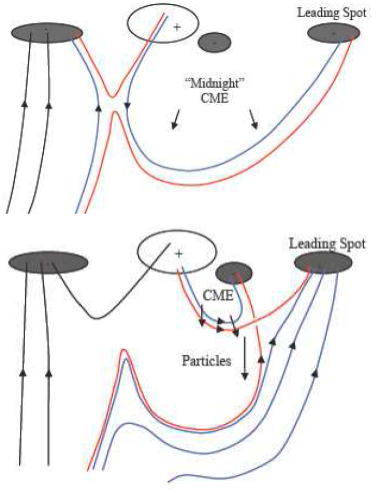 Reconnection between these two structures is suggested to create the electron beams that escape along transient magnetic field lines of the first CME. If the electrons are injected into a bundle of field lines which is narrow in the low corona, but becomes ever larger with increasing height, one can understand that the low-frequency part of the spectrum loses the characteristic type N shape, because individual bursts from a variety of densities merge into a quasi-continuum. Figure 4 : Cartoon scenario of CME interaction and the creation of a dipped transient field line on 2004 January 20.